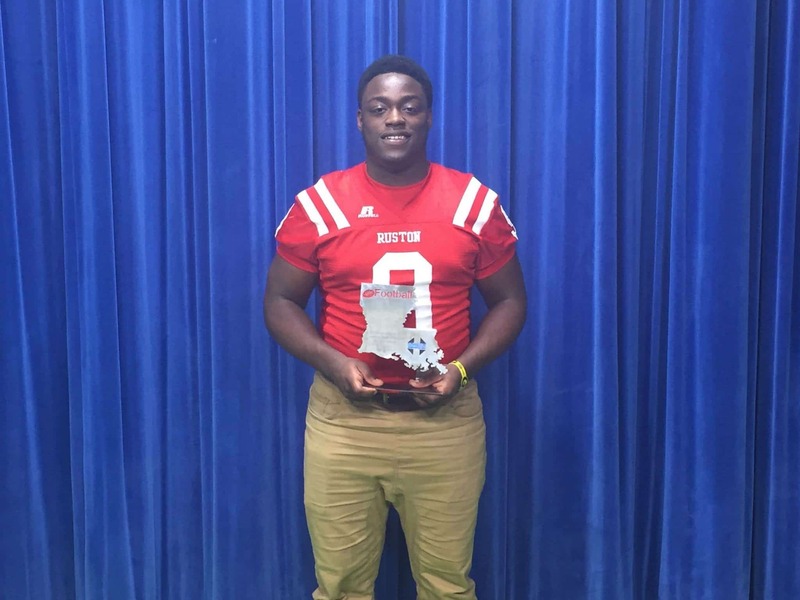 Ruston DE Tahjmalik Samuel is no stranger to sacking quarterbacks as he is one of the best pass rushers in the entire state. Samuel is also one of the most underrated players in the entire state. He may not be rated as a five star player nor is he the tallest player at 5’11, but he may be one of the most gifted defensive players that you will see play in Louisiana this season. Last year, Samuel broke out with a huge season racking up 15 sacks in the first five games. Samuel finished with 21 sacks, 34 tackles for loss, 74 solo tackles, 15 assists, 89 total tackles, and a forced fumble returned for a touchdown. Those are only his defensive numbers. At Ruston, Samuel also had a lot of looks on offense at fullback with nine rushing touchdowns and a receiving touchdown. His stats showed what kind of a motor and relentless play the senior Ruston defensive end showed on every play. 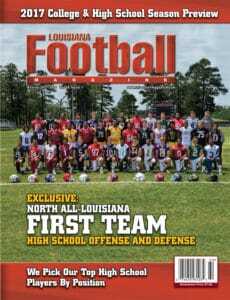 He was so impressive that he won our Louisiana Football Magazine 5A Defensive Player of the Year award at the end of the season and did it as a junior. 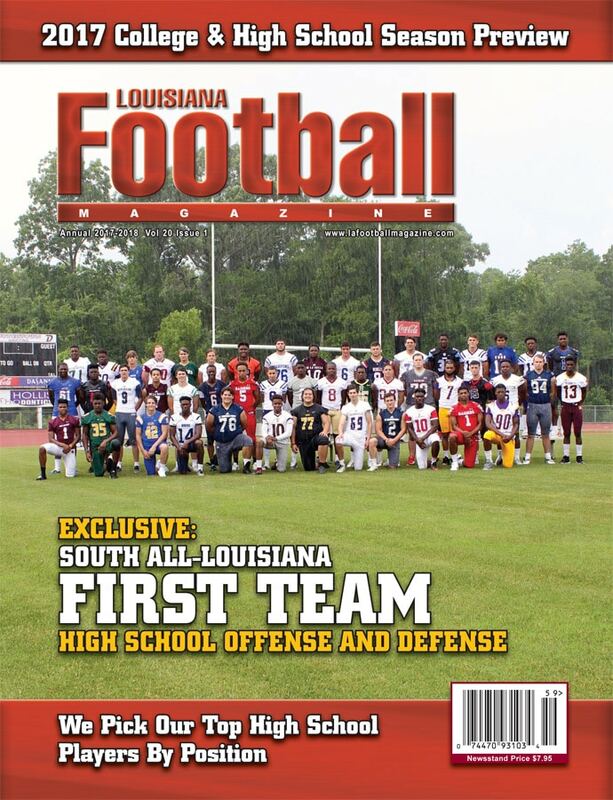 However, that was not the only recognition by us as earlier in the preseason, Tahjmalik Samuel was on the cover of our North Louisiana Magazine and made our All-North Louisiana team but as a middle linebacker and not a defensive end. 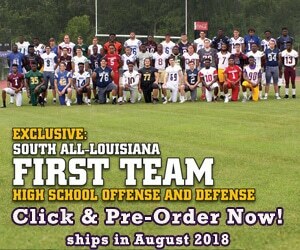 Louisiana Football Magazine’s recruit expert Lee Brecheen was the one who gave Samuel all these recognitions because he believes he could be a big time middle linebacker at the next level. Height may be a little overrated when it comes to defensive ends and linebackers. When you look at great defensive players like Elvis Dumervil (Louisville/Denver Broncos/Baltimore Ravens/San Francisco 49ers), James Harrison (Kent State/Pittsburgh Steelers), Sam Mills (New Orleans Saints/Carolina Panthers), and others, those guys were not the tallest players in the world, but they had great motors and Samuel could prove to be that type of player. So far, Samuel is wide open when it come to colleges and in the end, one lucky team will get a huge gem. 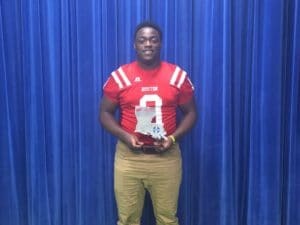 In today’s recruit spotlight, we caught up with the star Ruston defender as he talked about his reaction to receiving our award last season, his thoughts on last season, his top schools, and so much more! LAFM: What is your 40 yard time? 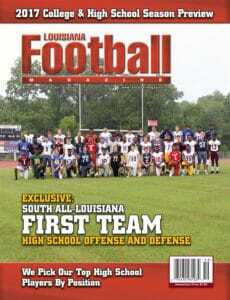 My top schools are Louisiana Tech, McNeese State, ULL, and Grambling. LAFM: This year, the team has a new coach in Jerrod Baugh. What is the difference between his approach and Coach Laird’s approach when he was the head coach? There isn’t any difference just the team is more of a family, but the work never stops. My biggest strengths are my speed and being able to play fast in all four quarters. I need to improve on mentally being focused and getting into a rhythm. I want to major in communication. 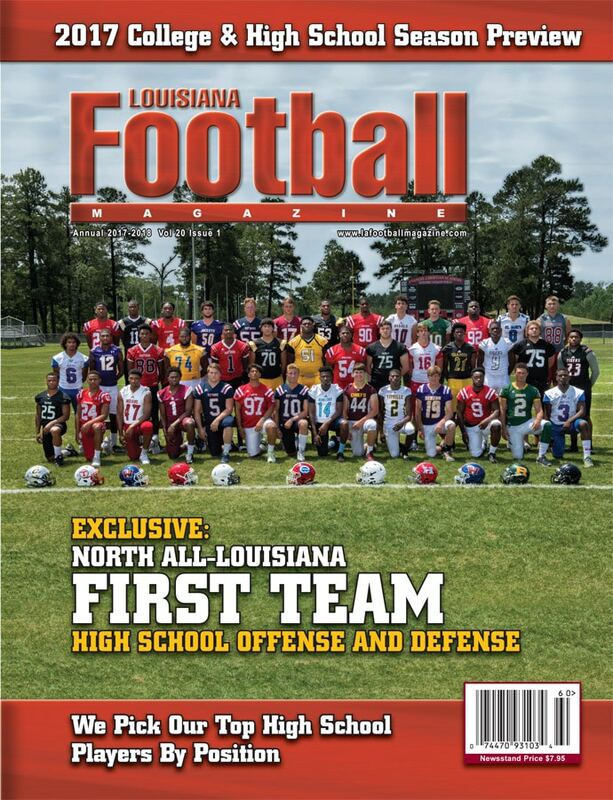 LAFM: Last year, you won our 5A Defensive Player of the Year in the entire state and did it as a junior. What was your reaction when you heard the news? I was shocked! It was a huge blessing and I still look at that trophy and thank God. LAFM: Last season, the team won seven games but lost to East Ascension in an upset. What are your thoughts on last season and how the season ended? We played good in the regular season, but we didn’t do what we had to do in order to be the better team. We just weren’t consistent with our game. LAFM: You had an impressive year racking up over 20 sacks and 34 tackles for loss. Coming into the season, did you ever thought that you were going to have the type of season that you went on to have and what played in the success that you had last season? My dad and I talked about it and we set high goals. I put in work over the summer and played my hardest. Then, God did the rest. LAFM: Who is a college or NFL player that you model your game after and why that player? I model my game after Cameron Jordan (Cal/New Orleans Saints). He is a talented guy and every time the Saints need that big play, he is right there. On and off the field, he is a hard worker and a nice guy. I really try to be like him. I would say the Neville game this season. I had two receptions for touchdowns. One of them was for five yards and the other touchdown went for 68 yards. I also had 17 tackles, a sack, and the big win against our rival! I like to fish, hunt, play basketball, and run track. LAFM: After achieving a lot of success last season, what are some of the goals did you set for yourself coming into this year and did you meet those goals so far? I wanted to become more of a leader. Not only did I want to better my game, but the guys around me as well. LAFM: This year, the team is 6-2 and on their way to another great regular season finish but what does the team need to do in order to avoid another early playoff exit? I want to thank my dad for all the sacrifices that he has made for me and bringing me to Ruston to make this kind of impact. I am really blessed to have a person like him in my life. He is the real MVP! LAFM: Our recruiting expert Lee Brecheen believes that you could play middle linebacker at the next level. What are your thoughts on that and do you prefer to stick at defensive end? I think he is right and that is the position I love the most. DE is cool, but I rather stand up where I can make some real noise. LAFM: What do you feel makes you stand out the most as a football player? What makes me stand out the most is my speed, being able to make good decisions at the right time, and just going out with a chip on my shoulder to prove myself every single snap of the ball.